A while ago, I was introduced to making paper bag scrapbooks. They turn out so cute, and are so easy! Last spring, I decided to try to make some articulation books using the paper bags. I loved how they came out. I was able to create pockets in the book for articulation cards- so fun! I used the books with a few students, and they went over really well with them. They loved coloring the pictures and placing them in the pockets. I originally just made /s/ for a few of my students, and planned on making a variety of sounds to share. Well, my slacker self got behind, and I never finished all of these books, until now! To create these books, all you need is three paper lunch bags (I got 40 for $1 at Dollar Tree), a stapler, scissors, glue, and decorative tape (optional). I have detailed directions on how to create the books in my preview of these books on TpT, HERE. Just click the Preview button. and staple the binding edge. By using the paper bags, you will create little pockets for all of the articulation cards that are included in the packet! How cool is that? Each book contains pictures for the sound in words in all positions: Initial, Medial, and Final. There are at least 5-12 pictures for each position. Your students will have a whole bunch of words to practice! I think what I love most about these books is that they are a great place to store your student's articulation words! No more sorting through card decks before you play a game. I think that in itself is a great reason for any busy SLP to use paper bag books! There is an idea page included in each book. These ideas are great for at-home practice, if you choose to send the books home. Each book also comes in a color version, and a black and white line drawing version. Your students will be able to color their own cards, and you won't have to waste any valuable ink! I used the color version to make books for myself. I laminated all of the pictures to make it last for use with many different students. Please know that I have several more of these books in the works, so by purchasing this bundle now, you are on the ground floor for savings! The price will go up as more books are added. 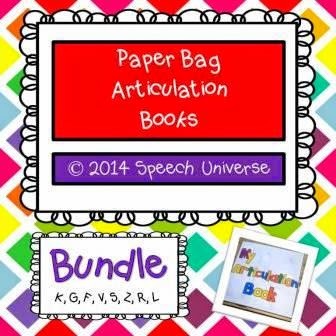 Hope you have fun creating paper bag articulation books with your students! Love this idea for a home program! thanks for linking!! I make those books too!